ADF Power Tuning – the shape of power to come! What are you Paying for Poor Power Quality? Improving power quality reduces risk, raises throughput, decreases the cost of doing business, and improves your bottom line. For support with making a decision for your facility, don’t hesitate to contact us. ADF Power Tuning products eliminate common electrical behaviors that contribute to poor power quality. 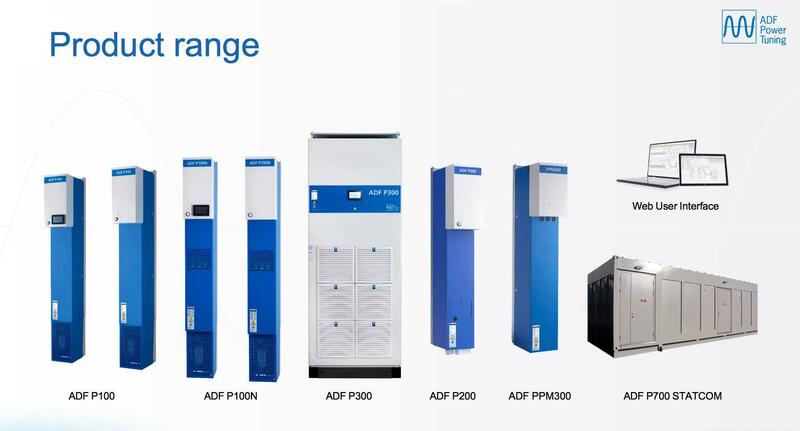 By using a highly dynamic, digitally controlled compensation and filtering approach, ADF Power Tuning restores the current waveform instantaneously, lowers the current flow, and fully compensates changes in load or installation conditions at all times. Common electrical disturbances and more can be solved with ADF Power Tuning solutions. Not to mention, ADF technology can assure power quality compliance and protect equipment warranties. An ADF unit is basically a very advanced computer-controlled current generator with the ability to instantly produce any shape or form of compensation current. A simplified diagram of the ADF operating principle is shown in the figure below. Each ADF unit is connected in parallel, in shunt, with the load that requires compensation. The power flows of electrical currents between the load and the network are measured and analyzed [ 1 ] to determine if disturbances such as reactive displacement and/or harmonics are present. If found, the ADF unit injects phase currents [ 2 ] that are the exact opposite of, for example, the harmonics and/or reactive displacement. This is done in order to cancel out the load behavior [ 3 ]. The result is an ideal load with a minimum of power losses and disturbances. The energy profile then appears ideal to the transformer. Since one module supports multiple drives, you can save space and ensure flexibility for the future. Increase energy efficiency while reducing the expense of replacing worn equipment. Avoid unnecessary downtime for maintenance or replacement of equipment affected by power quality issues. ADF-type technology is already being included in regulatory demands and equipment warranties — a trend that will only continue to grow. Please allow one of our in-house professionals discuss specifics with you. Call now 800.383.6956 or visit our Contact Us page!